The Kinesis Freestyle Edge is the most unusual mechanical keyboard that we have reviewed to this date. One quick (and rather inaccurate) way to describe it is “a tenkeyless mechanical keyboard that is split in two”. In fact, it features an entirely unique layout, with numerous changes over a typical ANSI or ISO keyboard. Two of the most prominent layout changes are those of the displaced Escape key and the omission of the right Windows and Menu buttons. 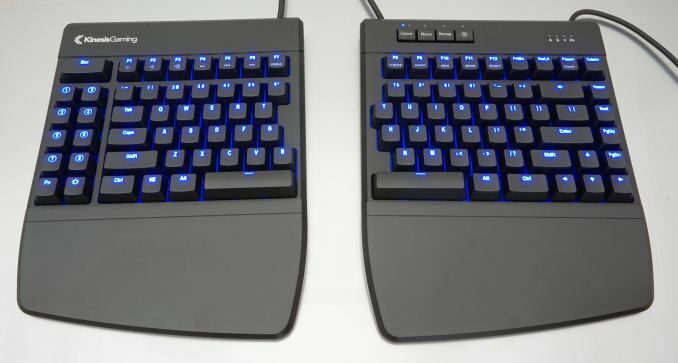 Although the Kinesis Freestyle Edge builds on the Freestyle series of keyboards that the company first marketed back in 2007, the number of improvements and features that the designers performed to make this keyboard more appealing to gamers and enthusiasts is vast. 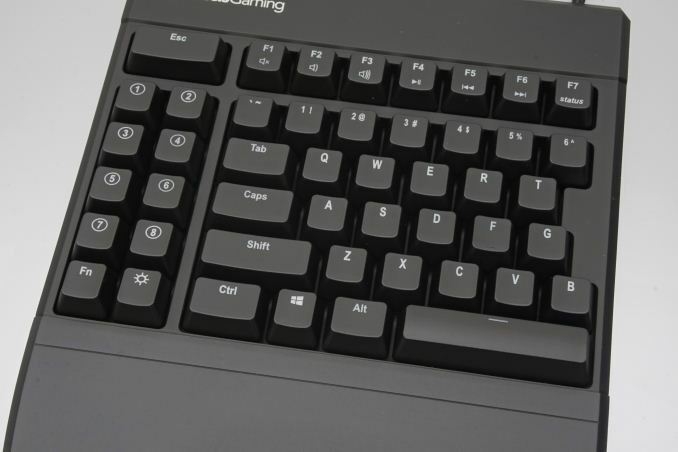 A closer look at the left part of the keyboard reveals the presence of ten extra keys, eight dedicated to macros and two for advanced commands. The Fn key does not operate as on most keyboards, meaning of the user does not have to hold the key pressed and then press another key to start a special command. Instead, it locks the keyboard to the “Fn layer” until it is pressed again. 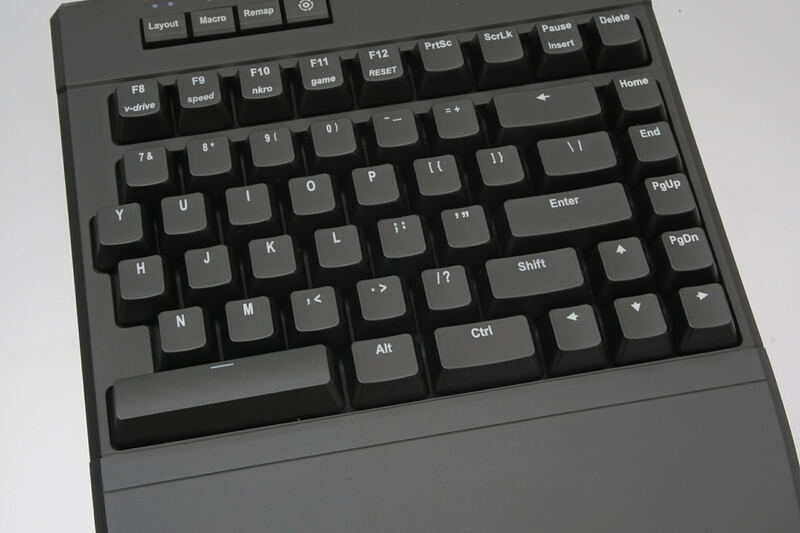 By default, the FN key only affects the first 6 function keys and the Pause key, which change to multimedia commands and to the Insert key respectively. 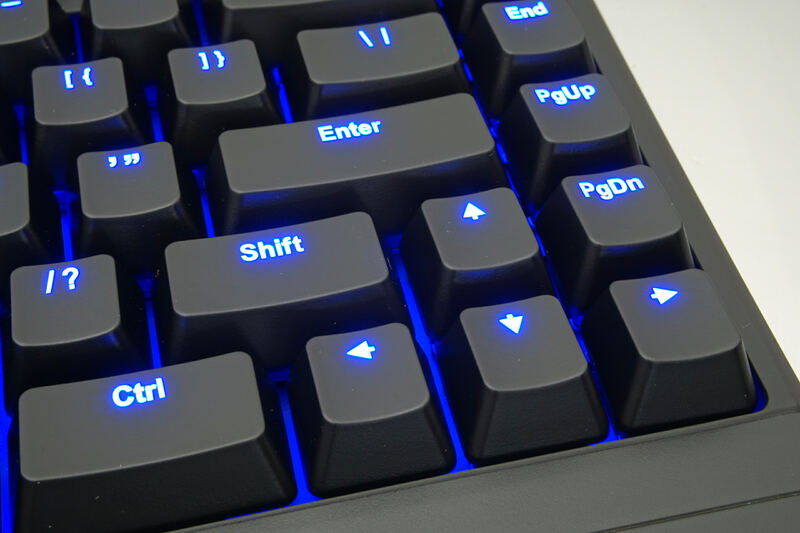 However, via the software, the user can reprogram any of the keys of each layer individually, including the macro keys, meaning that the keyboard can virtually change to an entirely different layout between the Fn and the top layer. Aside from its peculiar layout, there are no extra mechanical keys on the right side of the keyboard. However, there are four small surface buttons at the top of the right board. The rightmost button is the “Smartset” button and is used to access most of the keyboard’s advanced features. This includes the special commands printed on the F8-F12 keys, which do not belong to the Fn layer by default but can only actuated by holding down the Smartset button and then pressing that key. One needs to be careful here because, for example, the combination of the Smartset button and the F12 resets everything, so hours of programming different layers and long macros can be extinguished in an instant. The left of the four small buttons is the Layout button and allows for users to switch between the first three layouts of the keyboard. 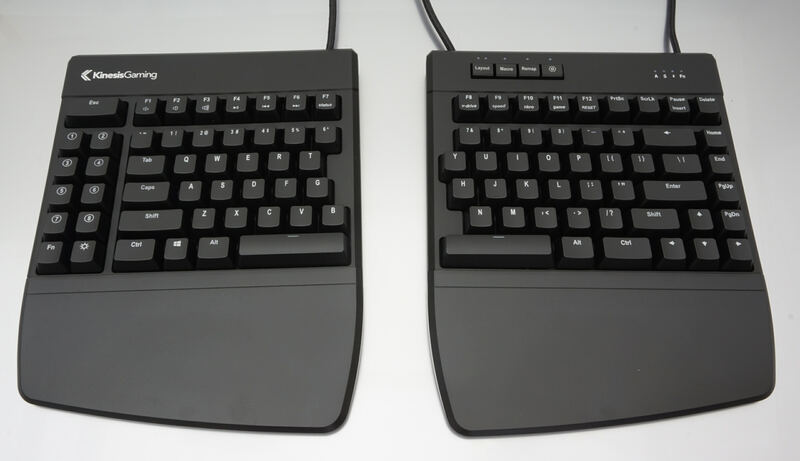 The Freestyle Edge supports up to nine layers though, and the rest are accessible by holding down the Smartset button and pressing a number from one to nine, in which case the keyboard will jump directly to the selected layout. The second button, the Macro button, allows for the quick recording of a macro and assignment to any key. It does not require any software to function and works in all layouts and layers, and on any key. 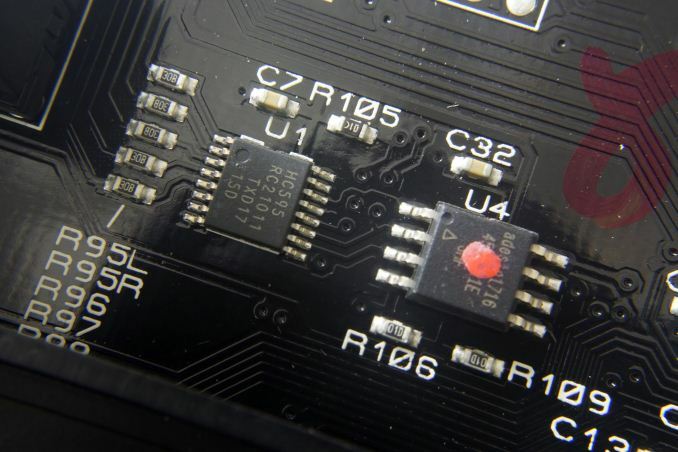 The final button, the Remap button, is very similar to the Macro button, but just remaps a button to any other instead of programming a more complex command. Each of the keyboard’s halves has five thick rubber feet attached, plus another two smaller feet can be found on each of the palm rests. The grip on a wooden surface is just right – enough to keep the keyboard from moving unintentionally, yet not high enough to be annoying when the user intentionally wants to move one half of the keyboard. The left half of the keyboard has a hidden compartment that can be used to extend or reduce the length of the cable connecting the two halves of the keyboard. A simple but cleverly implemented design allows for the cable’s length to be adjusted in steps of 1.5”. Note that, without the optional Lift Kit, the Freestyle Edge does not support any kind of tilt adjustments. A look beneath the keycaps reveals that the Freestyle Edge is using original Cherry MX Blue switches. There is a major catch here though. During our testing phase, the switches of our sample were peculiarly quieter than any typical Cherry MX Blue switch that we have previously tested. They were clicky and still audible, but the clicking noise was noticeably softer. After our contact with Kinesis about this, the company told us that they powder coat the support plate of the switches to reduce their noise output. Given that our ears realized the difference within seconds, the upgrade is easily perceptible. It does not make the Cherry MX Blue switch go quiet, but it will definitely appeal to people who live in shared spaces and want to keep the noise levels down. The keycaps themselves also are interesting. A closer inspection reveals that the keycap does not have a single layer of coat, but two. 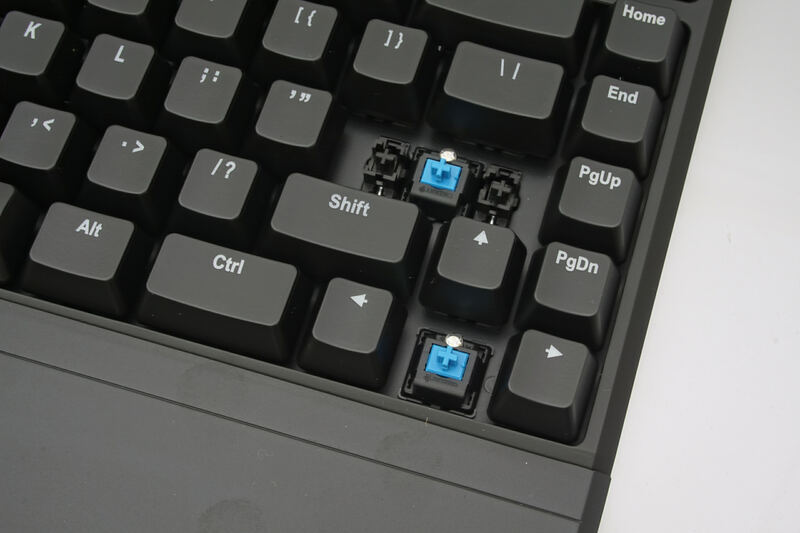 Keycaps are usually made of translucent plastic, then are painted black, and then the legend is lasered off. Kinesis added another layer of white paint under the black paint. A close look at the legend makes the difference apparent, as the characters are bright white and not greyish. The white paint makes the unlit legend brighter, but also diffuses the backlighting better. The Freestyle Edge features bright blue backlight. Naturally, as with all typical Cherry MX switches, only the top half of each key is lit, which is why Kinesis printed all of the legend characters at the top of the keycaps. Only the special commands on the Fn keys are partially lit. The backlighting is very strong; so strong that Kinesis almost instantly released a firmware to reduce its maximum level. Despite the very strong backlighting, due to the white paint that Kinesis used on the keycaps, the keycaps function quite like lamp shades, capturing the light and diffusing it. The backlight bleed around the keys is very soft and even, creating an excellent visual effect. Also, again due to the white paint, the diffusion smoothens the legend’s light, even at the lowest possible brightness level. 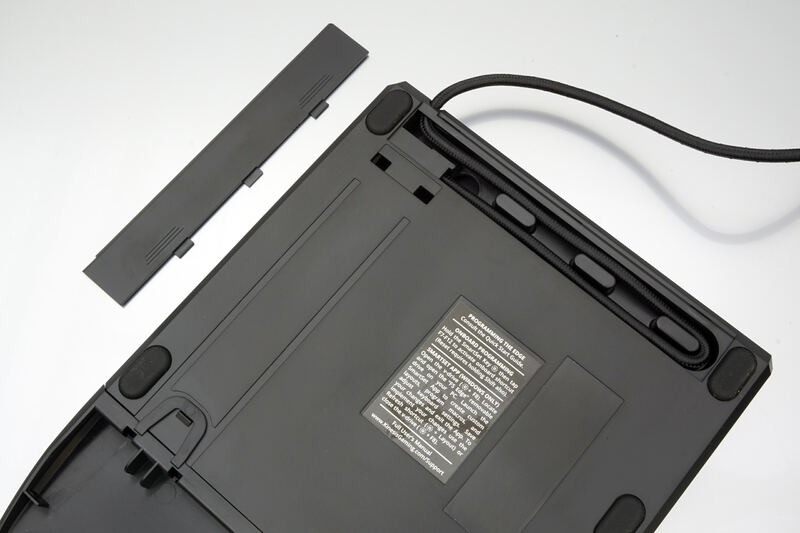 The optional Lift Kit allows each half of the keyboard to “tent”. It is a tilt mechanism but, instead of tilting the keyboard from the rear up, it lifts each half sideways, towards the hands of the user. It has three tilt angles, from five to fifteen degrees in five degrees steps. We should also note that the palm rests are a requirement for the lift kit to be attached, it cannot be used without the palm rests. Opening up the plastic cover of the keyboard, we revealed the thick steel frames that support the main PCB and the switches. 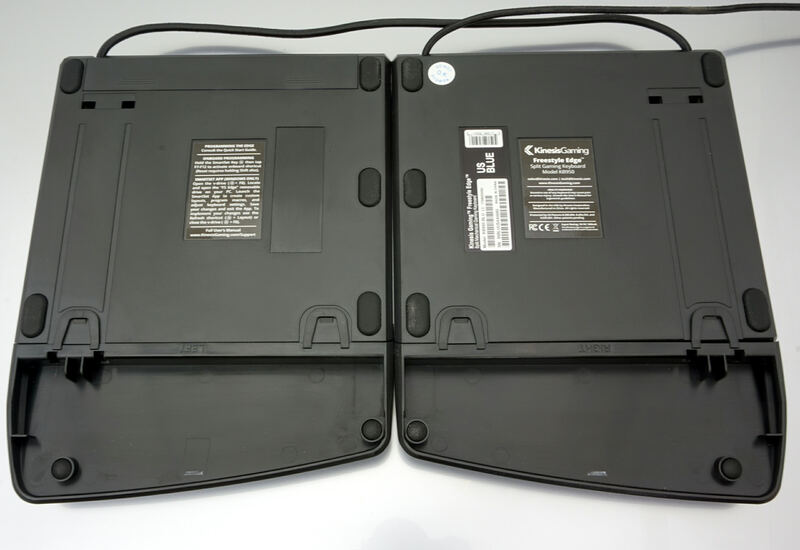 It is worthwhile to note that the caps of the four short buttons are attached directly on the buttons, much like the keycaps of the main keys are, and are not on or supported by the plastic frame. This approach makes them feel much better to the touch, as the buttons do not wobble at all and they have a respectable key travel, mimicking that of the main mechanical keys. The overall quality of the construct is outstanding, there was not even the slightest imperfection that we could find. The heart of the Kinesis Freestyle Edge is the Atmel AT32UC3B0256 microcontroller with a 32-bit, 60 MHz RISC processor. 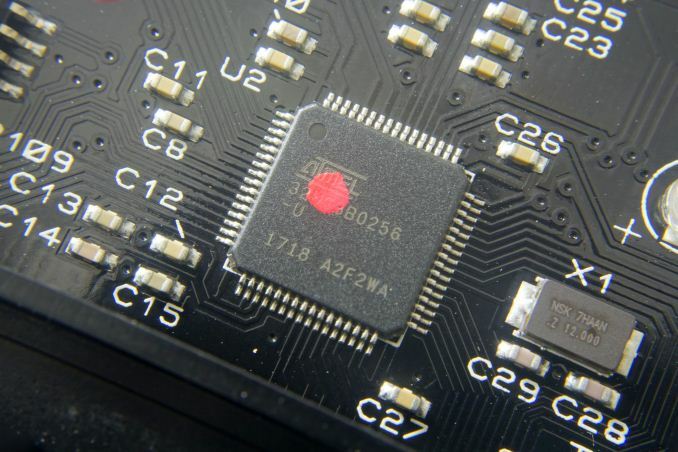 Kinesis probably selected it for its large 256KB integrated flash memory. It is not very popular, but it is more than adequately powerful for an advanced mechanical keyboard. Volume probably has something to do with it. "Two of the most prominent layout changes are those of the displaced Escape key and the omission of the right Windows and Menu buttons."